I like to use my own equalizer but the one onboard is good. Just a little tedious to set up. It has an "useful" CINEMA DSP for beginner to "enjoy" to. And I admit that the outlook of this 1600 was highly refined. - The price of this unit doesn't match the quaility of this 1600. - Actual power doesn't match the given 120 watt with 8 ohm. I've been a user for this receiver for 3 months. I bought it when December 2006 for $600. 00; I was wondering how you bought this product for $900; Can i asking you when you bought this product. I'm currently using the same models of your front speakers, surround speakers & center speaker, and I'm using the 10' of Paradigm Subwoofer. Can i asking you another question which is, what brand of Subwoofer you are currently using? The reason I'm asking this question is because, i feel that this Yamaha 1600 was unable to push for those speakers (but not SPEAKER) which we are using now, and when I try to louder the master volumn, i felt that the sound quality was very messy and I can't feel any "CLEAR AND NATURAL POWERFUL ,,SEE MOVIE I FEEL ,I IN THEATER ,,SOUND LIKE TRUE". That's why I changed my receiver from this 1600 to Pioneer 917, and i feel it was much more better than Yamaha 1600. Because even when i tried to louder the volumn, i still can feel the "CLEAR AND NATURAL POWERFUL ,,SEE MOVIE I FEEL ,I IN THEATER ,,SOUND LIKE TRUE" and my father doesn't complain it was "TOO LOUD ,,CAN BROKEN HOUSE" . But I admit that my Pioneer receiver was not suitable for listening to audio music (BUT NOT MUSIS) because it still an AV receiver only. I'm looking forward of your response as we were both interesting on AV. Thank you. Audio quality very poor in reguards to music it just lacks all "realisum"
I know this is a AV receiver but still it is from Yamaha and I expected a bit better audio quality. If you enjoy music and music videos stay away from this unit the sound is so compressed and processed sounding I could barley stand it even the the (so called) pure direct and the remote control was so poorly disigned it was frustrating to even try to program the unit though not impossible. Back to the audio quality, I used a Hafler P7000 outboard for the front mains and the pre-out section was so poor my hafler sounded like a mud cake absolutly no definition. It sounded smooth and warm but no realisum what so ever. The easy EQ worked well but again it didnt sound natural in any mode includint as stated earlyer pure direct. The build quality on the other hand was quite good it has the brushed aluminum and the overall build quality was very actualy quite good the controls were nice and smooth very firm feel. If you want a "prettie unit" this is the one for you if you want reasonably good sound and easy setup The Harman Kardon AVR635 Is by far a better sounding and much more logicly setup in all aspects but lacks the much nicer build quality and cosmetics. POWER POWER POWER! Did I say POWER ?! AMAZING sound quality. 2 HDMI inputs (and one output) Plenty of inputs of all kind. YPAO does magic. Learn button on remote. Eating your wallet, because when a such attractive receiver comes out on the market, you feel like if you had to buy it! 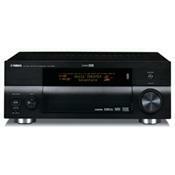 Just bought that new receiver to replace my one year old HTR-5740. First of all, when I've turned on for the first time, I was almost lost in all the audio features of this monster. But after a quick check up in the owner's manual, everything fine. I've use the YPAO to setup my HT and I was amazed by that feature. After running the auto setup, I got warned about a dephasing caused by my two front towers (Infinity Alpha 50). The program told me the plug them in reverse (neg to pos and pos to neg). I ran the YPAO again to check if it was truly working, and guest what? the warning was gone. This intervention finally resulted into a massive gain of bass power from the front speakers. After a couple weeks of using, I didn't notice any weakness on this receiver, and trust me, I'm looking for them. So just go for it.